In his article, the doctor explains how to have a healthy time on picnics or while traveling with stored food. During the summertime especially, the threat of food-borne illness is very real, but caution should be exercise year-round. 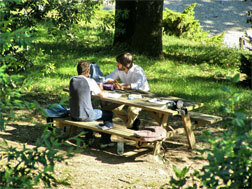 Summer vacations often include the pleasure of picnics, whether in a public park or out in the woods. However, the mishandling of food can result in undesirable consequences. Each year in the United States, 76 million cases of food-borne illness occur, up to 9,100 of which result in death. Contamination of food may occur during cultivation, harvesting, handling, storage, transportation, or preparation. Pregnant women, small children, and persons with chronic problems such as diabetes, liver cirrhosis, chronic kidney failure, AIDS, and cancer need to be extra-careful about enjoying picnic foods. The elderly are especially vulnerable because of weakened immune systems. Avoid raw fish, oysters, mussels, raw meat or poultry, non-pasteurized milk or cheese, lightly cooked eggs or egg-products such as Caesar salad, custard, cake batter and beverages like eggnog. Stay away from non-pasteurized fruit or vegetable juices (these should have a warning label). Never assume that just because your picnic food was purchased in the supermarket, it is clean and safe. The United States relies upon food irradiation (gamma rays) to some extent to destroy bacteria in foods. These rays pass through foods without leaving any remaining radioactivity. The irradiated food is not completely sterile. Companies are required to label the packages of foods that have undergone irradiation. The four basic rules of prevention are Clean, Separate, Cook, and Chill. Keep hot foods hot and cold foods cold. Bacterial growth is suppressed below 40°F and above 140°F. Abide by the 2-hour rule. Any food including fried chicken left out in the open for more than two hours should be discarded. The threshold should be reduced to one hour if the ambient temperature is at or above 90°F. Always bring an ice cooler to the picnic. Plastic or fiberglass coolers maintain temperature better than foam coolers but are heavier and more expensive. A block of ice is a better source of cold than ice cubes. Frozen boxed drinks offer a dual advantage. While thawing, they serve to maintain the cool temperature inside the cooler. Raw meats and other foods should be sealed in plastic bags before packing them in the ice cooler. Place them at the bottom with cooked and ready to eat food at the top to prevent cross-contamination. Cooked food should be cooled and then transported in the ice cooler. Fresh fruits, vegetables, and unopened canned meat spreads need not be kept in a cooler. Transported food is safe to eat only if there is ice in the cooler. If possible, bring two ice coolers, one for foods and the other for water and beverages. 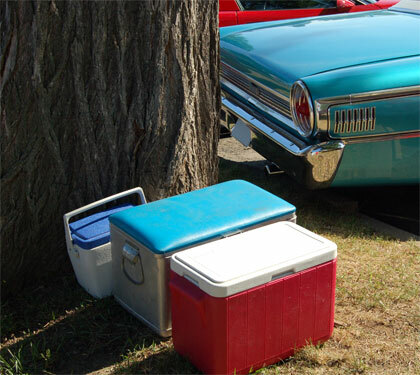 Coolers should be kept in an air conditioned section of the car and not in the trunk. Keep the cooler out of the sun while boating. Bring biodegradable soap and if necessary, water. Wash hands with soapy water frequently for at least 20 seconds, especially after handling raw meat or produce, playing with pets, using the restroom, and handling diapers. Disposable wipes are another option. Rinse raw foods in soap and water, using a vegetable brush to remove dirt. Additional protection can be accomplished by using further sanitizing agents, i.e. a solution containing one teaspoon of chlorine bleach in one quart of water, then rinsing well. Wash cutting boards often, especially after using them for raw foods. Avoid worn out cutting boards. Paper towels are better than cloth towels for cleaning. Keep raw foods away from cooked foods. Do not put the cooked food back onto a plate that held the raw food. Defrosting of meat should be done in the refrigerator, cool water, or microwave oven and not on the table. Always remember the 2-hour rule. Thawing 4-5 pounds of frozen meat, even in a refrigerator, takes about 24 hours. Do not marinate food at room temperature; use a refrigerator. Cook over a campfire or grill and use a clean food thermometer. The color of meat is not a good indicator of food safety. Cook steak, veal, or lamb roasts to at least 145°F, chicken (whole bird or thigh) to 180°F, chicken breasts to 170°F, and ground beef, pork, or lamb to 160°F. Fish should be cooked such that it flakes with a fork. Reheat precooked foods, and leftovers should be reheated to at least 165°F before consumption. Sauces, soups, and gravy should be boiled. Drink bottled or tap water. Avoid drinking water from a lake or stream. Water can be made safe by boiling for at least one minute. The use of water purification tablets plus water filters is another option. Water sanitizing tablets are meant for washing dishes. Discard the leftovers unless you have plenty of ice in the ice-cooler. Bag all your trash and dispose of it appropriately. Food poisoning symptoms are usually nonspecific and resemble stomach flu. Fever, headache, body aches, bloody diarrhea, and dehydration may occur. The diagnosis of food poisoning is based on the history of ingestion of particular foods and laboratory tests, including stool tests and examination of the suspected food. Most cases are mild and require only increased fluid intake to replenish the losses. Some patients may need hospitalization for hydration or other medical treatment. When Dr. Anil Minocha, author of the book, How To Stop Heartburn: Simple Ways to Heal Heartburn and Acid Reflux, wrote this article, he was the Director of Digestive Diseases at the University of Mississippi Medical Center in Jackson, Mississippi. He is now Professor of Medicine with Louisiana State University and Overton Brooks VA Center in Shreveport, Louisiana.